Twitter is the most famous social networking site after Facebook, where users can send short status updates known as ” Tweets ” consisting of only or less than 140 characters. Twitter is a great platform for marketers or artists to gain exposure. If you’re reading this article, chances are you already familiar with Twitter. You can interact with followers via direct messages, a feature that allows you to communicate with your followers personally. But what if you want to convey a message to your new followers such as sending them a warm greeting message or letting them know about your other social network pages such as Facebook, Google Plus Etc? It’d be hard and very time consuming if you decided to stalk your followers list everyday and send them a message one by one, this is where ” Automatic Direct Message ” comes in. Although they’re very controversial tools and is recommended you stay away from them, as they can end up doing the opposite of what you intended it to do. (i.e: losing clients/customers.) There are a lot of tools available on the Internet which allows you to send Automatic Direct Messages on Twitter. In this article, I will discuss a few trusted tools that you can use to do so. Crowdfire is a great tool for setting up Automatic Direct Message on Twitter. Apart from that, Crowdfire has many other features that are very useful, such as seeing who unfollowed you on twitter etc. This site is number 1 on my list as it’s completely FREE and very smooth to use. 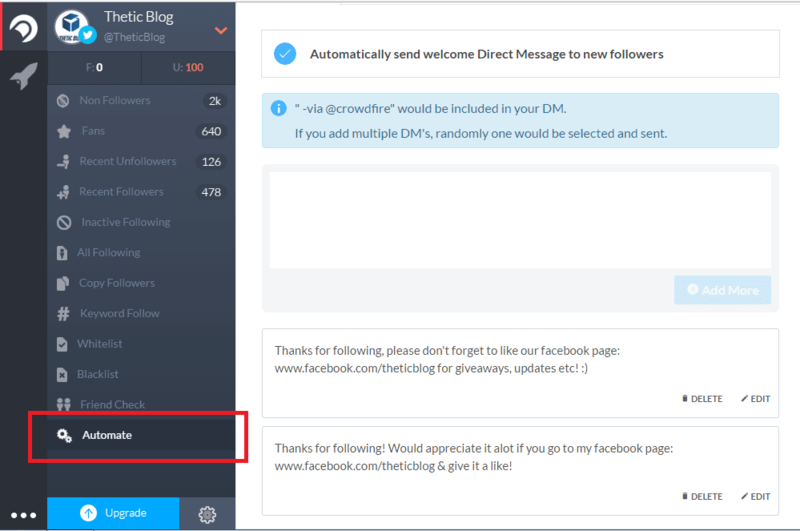 You can create many automatic direct messages and Crowdfire would send one randomly from the list. Previously known as Unfollowers.me. ​An alternative to Crowdfire. Setting up Direct Message is free, where as majority of the other features are for premium users. 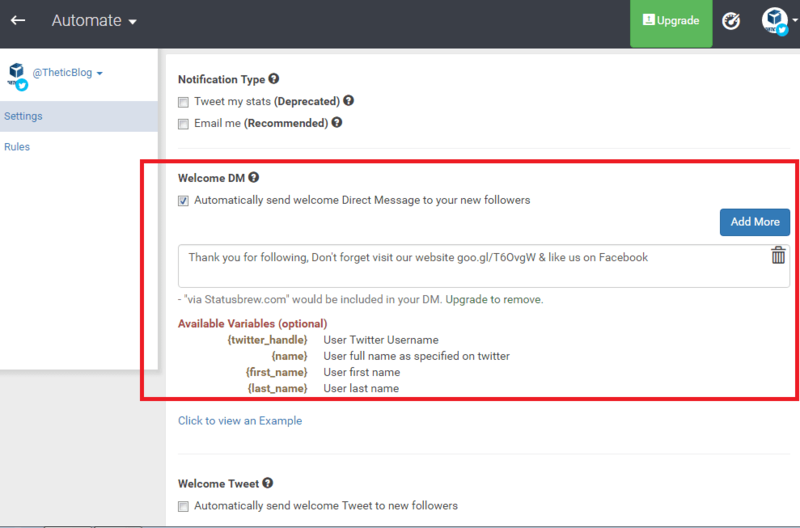 Although what makes Statusbrew unqiue is the fact that you can set up conditions to send out automatic direct messages/tweet, unfortunately this feature is available for premium users only but it’s worth checking out!